All institutions with block grant funding for open access from the UK Research Councils (RCUK) and the COAF medical charities submit annual reports on their APC spend to those funders. However, since reporting periods vary, and it can be difficult to compare spend across funders, at UCL we find it useful to collate our spend from our RCUK and COAF funds, as well as from our small institutional open access fund, and to draw out comparative data, including our average APC payment by fund, and most (and least) expensive publishers. What follows is an analysis of our APC spend from our three open access budgets for August 2016-July 2017. During this period, a total of £3.3 million was paid from UCL’s RCUK, COAF and institutional open access funds, for 1,946 APCs. 54% came from RCUK funds, 26% from COAF funds and 20% (including 100 unfunded SpringerCompact papers) from UCL funds. The average (mean) APC, across all budgets, was £1,704 (including VAT). The average APC paid from UCL’s institutional fund was much lower, at £1,363, because the UCL fund is reserved almost exclusively for APCs in fully open access journals. The average APC paid from UCL’s RCUK funds was £1,730; the average from UCL’s COAF funds was £2,167. 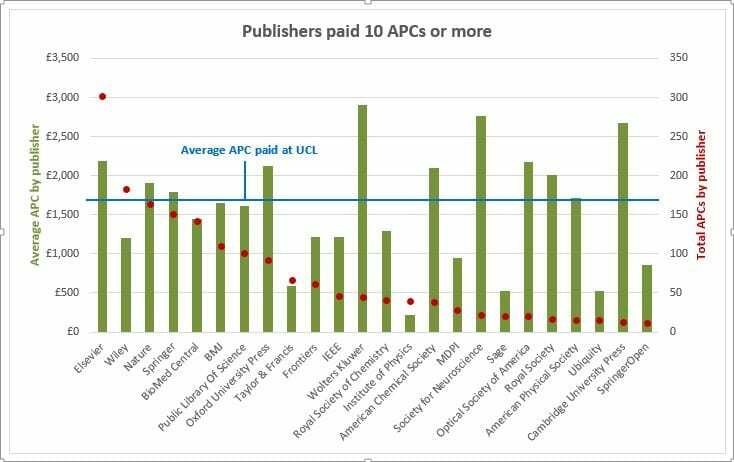 Although 99 publishers received APC payments from UCL, more than 70% of the APCs paid were to 10 large publishers. 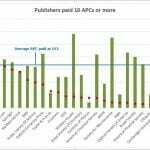 The average APC paid to these “top ten” publishers varies from £594 for Taylor and Francis papers to £2,184 for Elsevier APCs. 63% of payments were made under a prepayment arrangement, the rest by invoice. The chart below (click to expand) shows all publishers who received more than 10 APC payments from UCL’s funds in 2016-17. This comparison reflects the disparity between APC costs in hybrid and fully open access journals, the relatively high cost of APCs paid to some smaller publishers (Wolters Kluwer, costing £2,903 per APC on average, and Society for Neuroscience at £2,763), and also the large total sums paid to hybrid publishers in addition to subscription charges. When we repeat this analysis next year, and in future, we hope that we’ll see improvements resulting from genuine subscription/APC offsetting deals, of the sort that Springer and Institute of Physics Publishing have pioneered.